Tim Crouch and a smith discuss their new show at the Almeida Festival. “An engagement with a group of people sitting in a room together is an innately hopeful act,” argues Tim Crouch, leaning forward slightly in his chair. This statement is something of a starting point for what happens to the hope at the end of the evening, the new show that Crouch has co-written with his friend and long-time collaborator Andy Smith (who goes by the working name of a smith). When I ask about the impetus behind the work, the pair suggest that the title has been lingering in the background of their plays for a long time; Crouch mentions the character of Adrian in The Author and his comment that “there’s always hope, isn’t there?” Even in the work’s bleakest moments, hope is an integral part of its metabolism. “I think that’s why we go into the theatre,” says Crouch, as Smith nods in agreement. “I think the fact that we are making art is a hopeful thing.” When I speak to the pair in the Almeida Theatre’s rehearsal space, there is definitely a taste of optimism in the air. Despite having only a week of rehearsal time before opening the Almeida Festival – a tight timescale that they find both terrifying and exciting – the mood in the room is distinctly positive. That same afternoon they are inviting the Almeida staff in for a full run-through, speaking eagerly about the opportunity to try the work out in front of an audience – an opportunity that is perhaps even more important for the development of this piece than for their previous work. While Crouch and Smith have worked together repeatedly over the past few years, on productions including The Author and An Oak Tree, this new show marks something of a departure for them both. As well as co-writing the piece, they will be sharing the same stage for the first time, something that Crouch tells me has been “in the air” for some time: “I have long harboured the idea of working on stage with Andy”. The pair are the only performers in the piece and each occupy their own distinct space on the stage, in a show that Crouch describes as being “about two old friends and the complexity of an evening they spend together”. After our chat over lunch, Crouch and Smith are joined by director and regular collaborator Karl James for the afternoon’s work and the three men quickly settle into a comfortable rhythm. There’s both ease and teasing in the trio’s rehearsal shorthand – the marks of friendship and long collaboration. Crouch explains that all three “inhabit the same concerns about an audience and a connection with an audience activating the work”, as well as sharing “an identification with some of the challenges that exist in theatre”. The shift in this new piece, however, has cast their collaboration in a new light. “There’s familiarity – we’ve developed a shared language – but it feels like the language has been reinvigorated slightly by a change in the dynamic,” says Smith. He also discusses how the joint writing process has “illuminated” both his and Crouch’s separate artistic processes, revealing retrospectively the different ways in which they work. At the same time, Crouch is keen to stress that what happens to the hope at the end of the evening extends the concerns that have populated their previous collaborations, existing “on a continuum of conversation” with past work. It is fitting, given the joint history of these collaborators and their shared fascination with the form of the theatrical event, that what happens to the hope at the end of the evening is an exploration of theatre seen through an exploration of friendship. Unlike many theatrical devices that function as mere vehicles or mouthpieces, here the two central themes are inextricable from one another. As Smith puts it, “the story of the friendship is mirrored in its form”, while the structure of live performance finds expression through the relationship between two old friends; both involve meeting together in a space and negotiating that space separately and together at the same time. 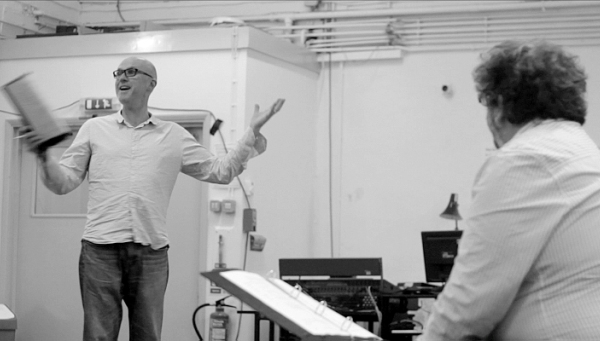 Tim Crouch and Andy Smith in rehearsals. As well as this tension between two different understandings of theatre – one open and acknowledging of its audience, one frantically attempting to construct a form of realist representation – the piece explores another opposition, between movement and stasis. “Two channels of consideration in this play are around action and inaction,” says Crouch. “So my character is active – politically active, sexually active, physically active. Andy’s character in this play is inactive or reflective.” While the strain between these two positions powers the play, it is important for Crouch and Smith that “we don’t at any point resolve that”. There is also another kind of action or inaction that this show implicitly, gently interrogates: that of the audience. Countering the discourse that would position theatre audiences as passive receivers, Smith firmly says, “I do consider going to the theatre and sitting in the stalls to be an action”. His reasoning recalls that of Jacques Rancière in The Emancipated Spectator, a text quoted at the front of Crouch’s collected plays. “There is space left for the audience,” Smith continues, “space for them to occupy mentally, physically. I talk about the space of the theatre and what we do here and what we can do here.” Although, as Crouch is quick to add, “that discourse is problematised as well”. For all these concerns about the theatrical event, however, Crouch and Smith are adamant that this is not just a show for people who regularly attend and think about theatre. “There’s so much language around theatre,” Crouch reflects. “We play with that language about theatre, but I don’t think this language is just for people who are thinking about theatre; I would be disappointed if it was.” Smith adds, “it is a discourse on theatre, but I hope it’s entertaining, I hope it’s a distraction, I hope it’s a good evening out”. Alongside all these competing ideas – ideas that the piece “problematises and challenges and gets dirty with” – the work is also in dialogue with the particular festival context in which it finds itself, both at the Almeida Festival and in the Forest Fringe programme in Edinburgh next month. As a show about both the space of the theatre and what we do when we leave that space, what happens to the hope at the end of the evening is a perfect festival primer. what happens to the hope at the end of the evening is running as part of the Almeida Festival 9th-18th July and is then appearing in the Forest Fringe programme at the Edinburgh Fringe in August.